Now that summer has officially arrived, caregivers can try to keep their senior loved ones healthy and happy by making sure they are properly hydrated. Not drinking enough water can be the catalyst for several life-threatening health issues, which makes senior hydration even more important. Here are a few of the most dangerous effects of dehydration for older adults. Kidney issues are common for seniors that don’t drink enough. Without enough water in their system, the blood won’t be properly filtered, which can cause confusion, lethargy and, in some cases, kidney failure. Seniors who suffer from Diabetes are especially susceptible to diabetic ketoacidosis, a condition that causes naturally occurring acids in the body to build up, potentially causing organ failure, coma or death. Dehydration can lead to heart attacks or heart failure. Lack of water in the body causes the blood to thicken, making the victim’s heart work much harder than usual to circulate blood throughout the body. Dehydration can cause damage to the brain. A deficit of water in the body can lead to seizures and headaches. In addition, if a senior citizen who is seriously dehydrated drinks too much water too quickly, it can cause their brain to swell, potentially causing permanent damage by making brain cells rupture as they expand. How Much Water Should a Senior Consume? A good idea is to find a 64-ounce pitcher, fill it with water and keep it iced on your kitchen table or in your refrigerator. Every time you walk past, stop to take a drink. Latiece said when you’ve finished off the pitcher, you know you’ve had enough to drink — and you don’t have to remember how many individual glasses you’ve had. Flavor enhancer concentrates help make drinking water more interesting or enjoyable. Some seniors also like to drink water infused with fruit to make their daily water intake a little tastier. Anything that ensures you drink enough water can help. Fruit such as melons often have a high water content and can help seniors stay hydrated, although water from fruit is difficult to measure and track. Dehydration often gives early warning signs before it causes permanent damage. But caregivers have to be alert for the symptoms and be prepared to act quickly if they start to appear. Seniors who are dehydrated have to relieve themselves less often. If your loved one isn’t going to the bathroom at least once every two hours when they’re awake during daytime hours, they might not be drinking enough. The darker a person’s urine, the more highly concentrated the waste is, and that’s a sign that there isn’t enough water in their body. Whenever a person’s urine is darker than usual, it’s a good time to drink some water. When you don’t have enough fluid in your body, your mouth is one of the first places symptoms start to show up. A dry, sticky mouth is a sign that there isn’t enough fluid in a senior’s body. A severe, throbbing headache is often a sign of dehydration. Headaches caused by a lack of fluid can happen throughout the brain – the front, the top, the back – and are often aggravated by bending over, standing up or exerting yourself. If your senior has a headache that you believe may be caused by dehydration, ask them to cease any activities they’re doing and gradually increase their water content, offering about 8 oz. of water every 15-20 minutes until their symptoms are relieved. 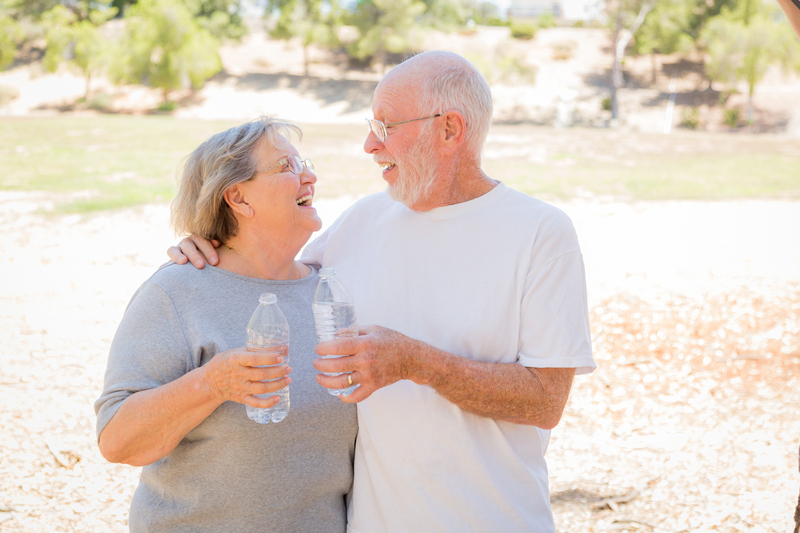 Watch for the warning signs of dehydration and follow these senior hydration tips and guidelines to make sure your loved one is properly hydrated for the summer months. For more senior health tips from Bethesda, check out our Senior Health and Wellness articles.